Peppers have "bruises" What do I do? First, I am so glad this forum is back up!!!! Okay, so now my peppers. I don't have a picture, but I can take one tonight and post if needed. I have found that some of my peppers look like they have bruises on them. Like, as if something hit it. 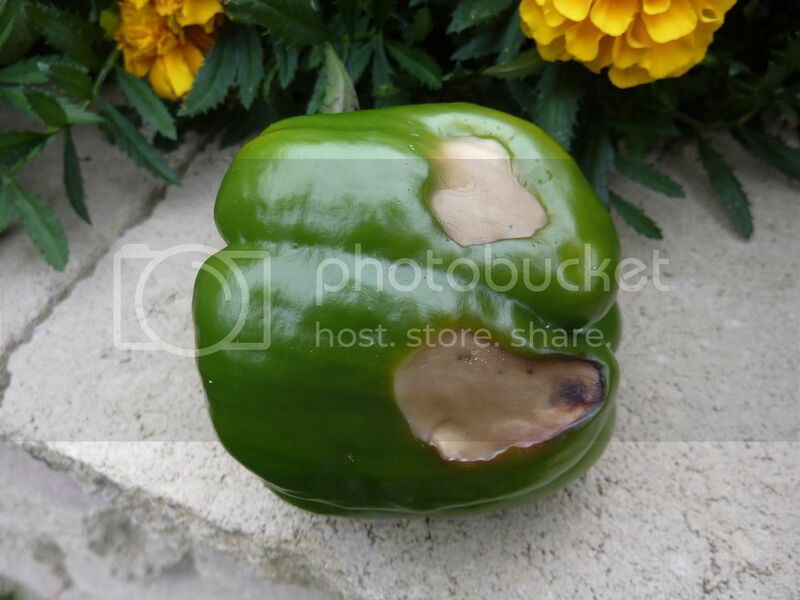 The spot is soft and discolored, no hole or anything, and the rest of the pepper seems fine, and the plant is fine. The peppers are still growing as if nothing is wrong. And other peppers on the same plant do not have these "bruises." Once ripe, if this "bruise" doesn't "spread," is the pepper still safe to eat if I cut off that part? If the "bruise" is on the bottom, the end away from the stem and is dark and mushy, it is probably Blossom End Rot. You can type that into the Search the Forum Keyword box and find lots written here about it. It is related to the calcium deficiency Mg described, but more often has to do with various stressors making it difficult for the plant to uptake calcium, than an actual lack of calcium in the soil. If the spot is beige/tan, occurring on the side or where ever direct sun hits, and is not mushy but thin skinned in that spot, that would be the sun scald. I don't think it's sun scaled - it is soft. And it's not on the end of the peppers - it's on the sides...I will take a picture when I get home and post - I think that might help! Could be anthracnose fungus too.... Since any of these soft areas will get bigger the longer they stay on the plant, I tend to pick them at whatever stage they're at and generously trim off/discard the inedible portions. I think it is BER! I looked up all the info/pictures of each thing suggested, and found out that it could be due to the calcium deficiency from uneven watering, and it could definitely be that too cuz they are near the tomatoes and the tomatoes also have it I think. There's been barely any rain here, and I've been really busy lately and unable to get out there every day to water and then there would be a thunderstorm with lots of rain fast and then be super hot and dry for the next two days, and since the garden is in a 18 inch raised bed it drains really quickly. I heard eggshells might help? Or lime? I am not sure if I can get to the store right away to get lime, so might try the eggshell thing first, and try to get out there every day to water! I picked some of the peppers and threw them out cuz they were bad, some I picked and am trying to save, cuz I hear you can cut off the bad part and the rest of the pepper is okay to eat, and a couple I left on the plants to see if the spots get bigger. At first, not knowing, I put the peppers in the fridge, but then found out they won't ripen - and they are supposed to be yellow peppers - do you think it be okay to take out of the fridge to ripen after it's already been in there for a couple of days? You can eat them green like -- you know -- green peppers. They do change color after several days if they have already started to blush, just like tomatoes, but since bell peppers taste better when they are juic and crispy, I don't find it's worth it. Also, ones with defects are more likely to spoil. Don't worry, there's still time for your plants to produce more peppers. Because of their hollow core, once mold gets INSIDE the fruits, they can spread throughout the interior even when they seem OK on the outside. 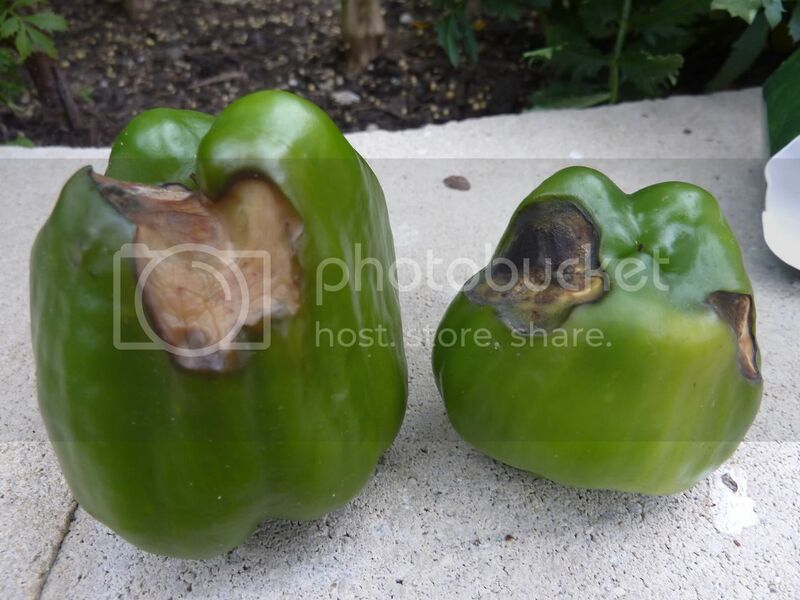 I think any (hot or sweet) pepper fruits with defects/holes should be picked as soon as discovered and processed -- trimmed and eaten, frozen for later cooking, etc. What about black lines on the skin? The fruit is fine, not rotting or anything, just I've noticed a black vein running down the sides of some.